I did miss turntables when they went away for 20 years, prior to marching back home as heroes. I missed the ritual of putting on records. I missed the extraordinary technology. As Greg Borrowman of Australian Hi Fi magazine once observed, it’s remarkable that such unlikely technology actually works. Take the tonearm, pivoting from the rear of a turntable and supporting the cartridge and stylus as they track across the record, following the groove as it spirals inwards. As it tracks the stylus describes a gentle arc across the record’s face, and only for two single moments is it exactly tangential to the groove – at all other points it slightly favours one record wall over the other. It has always been a given that longer arms, describing gentler arcs, yield greater accuracy in balancing stylus exposure to the right and left groove walls. Most arms are around 30 cm from pivot to stylus but in the record’s heyday the BBC used 37 cm arms. Some turntables have been built with 40 cm arms. 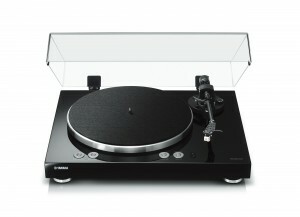 But Yamaha’s return to the turntable market is marked by arms that are significantly shorter at 22.35 cm. For a company so steeped in hi fi this is surprising, but then Yamaha has never been afraid to innovate. Susumu Kumazawa, Yamaha’s lead hi fi engineer, says shorter tonearms rule out the need for an anti-skate device. Okay, unequal sidewall pressure may be fractionally more of an issue, but will anyone notice? Kumazawa-san obviously thinks not. And you can only admire Yamaha’s chutzpah because the shorter arm is also going on the flagship $8000 GT5000, releasing soon to the purist market. Set up is easy. 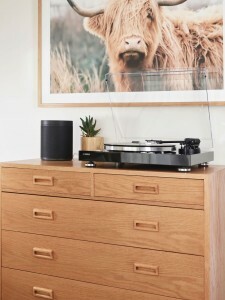 For a turntable. Unpack – there’s lots of unpacking – and follow the instructions. Nice to see owner’s manual rather than a quick start guide. It took me 20 minutes. Don’t be afraid of the anti-skate, it’s just a dial that you set to match the tracking force of the stylus. A stylus is supplied, fitted in a headshell that can’t be connected incorrectly. No one at Yamaha seemed to know if additional headshells are available. First published on smh.com.au February 2019.